Our test platform has been refreshed for 2018 and now includes a hexa-core Intel Core i7-8700K processor overclocked using 1.225v to 4.8GHz across all cores. The 12-thread chip is paired to 32GB of dual-channel G.Skill Trident Z DDR4 memory set to run at 3,200MHz using the built-in XMP profile. To get a feel for how the coolers compare, CPU temperature is logged while a large 4K video clip is encoded in multiple passes using the freeware HandBrake utility. The workload tasks all available threads for a prolonged period and, in order to provide a stabilised reading, we then calculate the average temperature across all cores from the last five minutes of encoding. Our be quiet! Dark Base 700 chassis is set to run with its two stock SilentWings 3 PWM fans - a 140mm front intake and a 140mm rear exhaust - both of which are set to low speed (setting 1) via the integrated fan hub. All CPU cooler fans are set to a 'silent' profile from within the Asus BIOS, and when testing liquid coolers the pump is connected to the motherboard's dedicated water-pump header. When a radiator is used, it is installed in the roof or rear of the chassis and any bundled fans are configured to push air through the radiator and out of the enclosure. 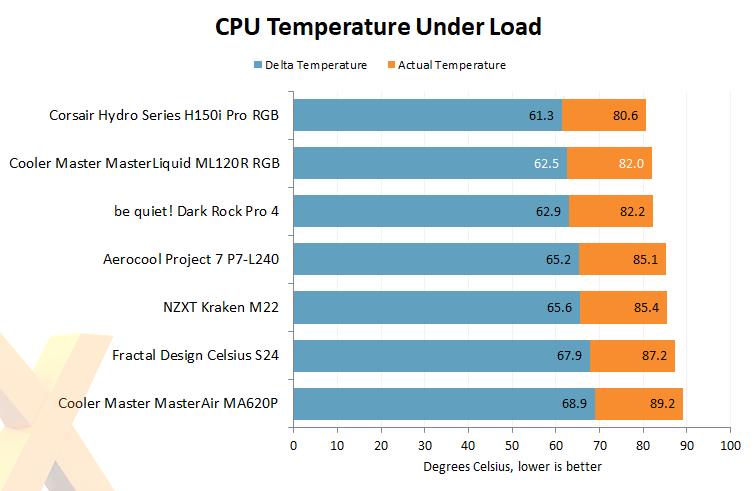 A Core i7-8700K gets toasty when running at 4.8GHz across all cores, and it's in this sort of overclocking scenario that a high-end cooler makes good sense. Proving that size alone needn't be the determining factor when choosing a radiator, Cooler Master's ML120R does a stellar job with its dual fans operating in a push-pull configuration. But there is a slight catch. In an effort to keep temperatures as low as possible, the bundled fans are somewhat aggressive and are, in our estimation, a little too eager to spin at higher speeds, at which point they become clearly audible. 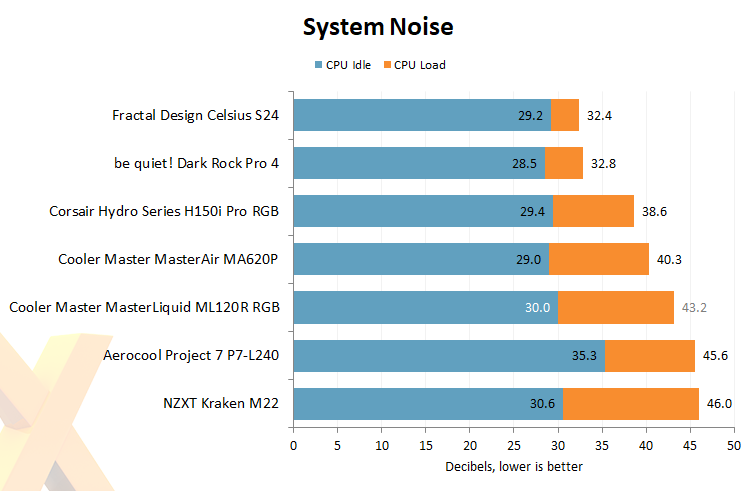 The pump, however, remains suitably quiet at all times, meaning fan noise can be easily balanced using a custom curve in BIOS.